Sundal is basically a dry legume (lentil) preparation which is spiced, tempered and stir fried along with grated coconut. Sundal recipes are usually prepared in South Indian households. Commonly prepared with legumes like white chickpeas, black chickpeas, green peas, black-eyed peas, rajma, thuvar dal, green gram dal, white dolicho beans or mochai, horse gram, bengal gram, peanuts and so on. Legumes are the most nutritious foods available. They are rich in protein, folate, potassium, iron, magnesium, beneficial fats, soluble and insoluble fibers. Sundal recipes are traditionally prepared during the festivals like Ganesh chaturthi festival, Navarathri fastings and Gokulashtami festival in South India. They are simple, comfort dish and make for a healthy tiffin and snack or naalumani palahaaram. Since they are quick to prepare, they can be served as a side dish with rice as well. And this is absolutely “No onion, no garlic” recipe. Rinse the channa with water and soak it overnight (or at least for 8 to 10 hours) with enough water. Next day, drain the soaked water from the channa. Pressure cook them with 3 to 4 cups of water for about 4 to 5 whistles or until they are cooked soft but not mushy. Once the pressure leaves the pressure cooker, remove the cooked channa, drain the water and set aside. Heat a kadai with oil, add the mustard seeds and allow it to splutter. Then add the split urad dal and allow it to turn slightly brown. Then throw in the red chillies, curry leaves, a pinch of asafoetida and the pressure cooked channa into the kadai. Add salt, mix and stir fry until the moisture in the channa evaporates. Then add the grated coconut and fry for few minutes until the coconut gratings are cooked and slightly reduced in shape. Remove from flame. Serve the delicious channa sundal as prashaad or neivedhyam first, and later eat as such like a snack or with rice or sambar saadham. I prefer to add salt only after tempering and during the stir frying of the channa. Do not add salt to the channa while pressure cooking, as it may overcook the channa and you may not get the perfectly shaped sundal. Optionally, you can add green chillies instead of red chillies to prepare this sundal. A piece of ginger can also be added to the sundal. Or else, grind the ginger, green chillies and grated coconut with little water and add it to the channa and stir fry. Love this sundal! It has a festive flavour and I often plan to make it but go to the curry instead. Inspiring presentation, Aiswarya! Thank you Sridevi 🙂 Yes, it has got a festive flavour attached. Do try it out, it is easy to prepare and delicious too! Protein rich n yummy. Chickpeas n coconut make an awesome combination. Nice click. Yes, they are a tasty and healthy combination. Thank you Namrata. 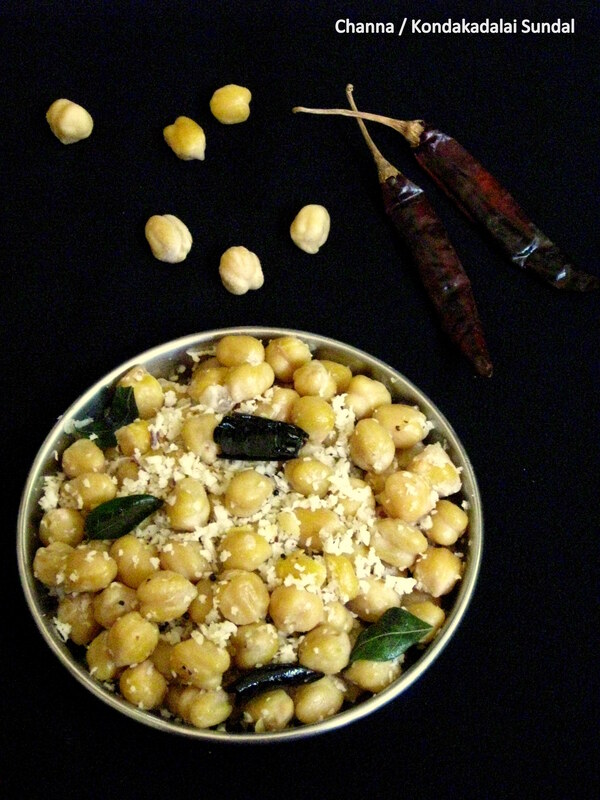 I have been looking for a good recipe for channa other than the usual north Indian preparation. Thank you!